My dad is a gigantic baseball fan and has watched Field of Dreams with Kevin Kostner about a gazillion time. I can't tell you how many conversations have ended in the whispered punchline and lesson: "If you build it, they will come!" Me, I'm up to watching a Toronto Blue Jays home game every season, and would love to watch them win another World Series in 2014! I'd even be elated to see the Jays make it to the World Series, and feel the intense buzz of hopefulness and pride around town! 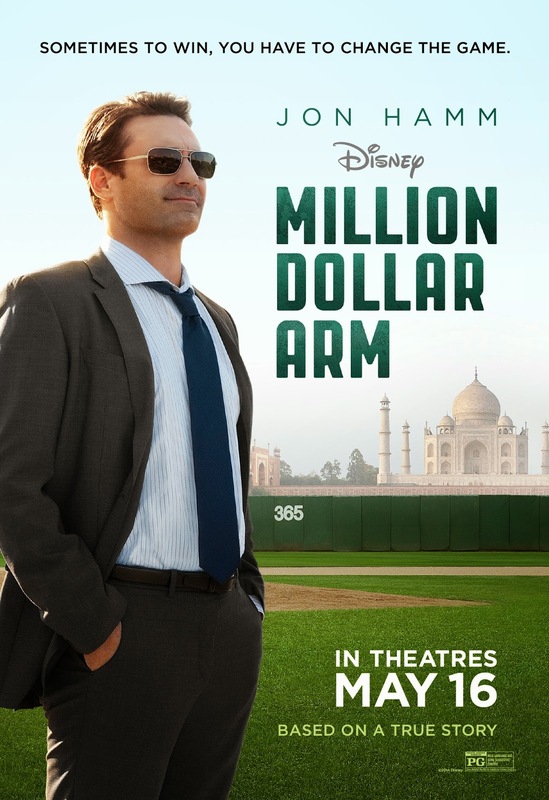 On the topic of baseball, Disney's Million Dollar Arm movie comes to theatres on May 16th! It's based on the true story of sports agent J.B Bernsteain (Jon Hamm), who set out to find baseball's next all-start pitcher. J.B. travels to India, hoping to find a young cricket player that he can turn into a major league baseball star. Once there, he cleverly produces a reality show contest called: "The Million Dollar Arm." With the help of retired baseball scout Ray Poitevint (Alan Arkin), J.B. discovers Dinesh (Madhur Mittal from Slumdog Millionaire), and Rinku (Suraj Sharma from Life of Pi). Dinesh and Rinku are 18-year olds who can throw a great fastball, but are unknowledgeable about baseball. In the hopes of signing the young men to major league baseball contracts, J.B. brings Dinesh and Rinku to America to start training. As they learn baseball inside out, J.B--with the help of insightful friend Brenda (Lake Bell)--learns important lessons about teamwork, commitment, and what it truly means to be a family. (VIDEO) Check out the movie trailer for Million Dollar Arm, below! 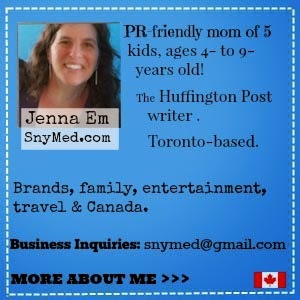 WIN 1 of 14 double passes to see Disney's Million Dollar Arm movie advance screening from SnyMed.com! 4 tickets (2 pairs) are available for each of the following cities: Calgary, Edmonton, Ottawa, Toronto, Vancouver, Waterloo, Winnipeg. Movie will be on Wednesday May, 14th, 2014 at 7:00pm (7:30pm Winnipeg). Show will Contest ends on Thursday May 8th, 2014.
check your e-mails and spam by Fri May 9th! Leave a COMMENT below stating if you like baseball OR your favourite sport OR if you have a sports hero. Then use the entry form below to enter the contest. GOOD LUCK! Would love to see this in Waterloo! I am a fan of Baseball, I remember going to my first Jays game as a teen, I also remember a time we were stuck in traffice on the gardiner for hours trying to get to a game! I can't wait for this movie, softball was my sport of choice growing up, as an adult slo-pitch and that is where I met my husband of 20 years!! When we go to the States, we always try to catch a MLB, I've been fortunate enough to see the Yankees (old stadium), Mets, Dodgers vs the Expos (yes that makes me old). My sons play tball and they love it. I am a tennis fan. I have been seeing the previews for this movie for months. I'm looking forward to seeing it. We are a baseball loving family, my son has played triple A for 7 years. I like baseball and I'm looking forward to this movie. I also like hockey (Go Habs! ), football and the Olympics. I love baseball! I admire Mark McGwire the most! I like baseball, but more of a hockey fan! love baseball as long as im playing not watching! LOL Would love to see this! Love John Hamm and baseball! Thanks for the contest too, not many do Waterloo! My son is 2 and a sports fanatic. Any sport, he wants to play. We go see the Jays play when possible. Love baseball -- especially live sports. Hope to see this movie -- haven't seen a good one in a long time.